Class Registration Don't wait to register. We pride ourselves on our large, clean classroom; but to ensure that each student has space to work, class sizes are limited. We require a minimum of three students, and a class will be cancelled if that number is not met. Fees are due when you register. This will hold your space in the class. You may register over the phone, in person at the shop, or by mail, using a credit card, cash or check. If a class that you are interested in is full, we can put your name and phone number on our waiting list. All classes have a supply list of necessary items. Some of the classes require homework before class. Please review your supply list when you receive it so we can answer any questions. 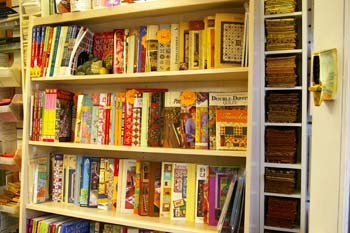 We respect the copyrights of books and patterns. Students are required to have their own book/pattern for class. Class supplies can be purchased at our shop at a 10% discount. We want your project to last at least a lifetime, so we work very hard to ensure that items used for classes are in stock and of the highest quality. Class Levels We indicate the skill level for each class offered. "Beginner" implies that the student has working knowledge of her machine. The instructor will cover the basics. "Confident beginner" implies basic knowledge of your machine and basic quilt-making/sewing skills. "Intermediate" means that you've done a few projects and are ready for a greater challenge. "Advanced" is reserved for those who've already logged lots of hours on their machine and have mastered several techniques. Sewing Machine Rentals for Classes Don't want to deal with the hassle of bringing your machine to class! Not a problem. Bernina sewing machines are available to rent for any of our clubs, classes, or workshops. The rental fee is $20 for a full day or $10 for a half day or less. (Advanced notice may be required).